Heat oven to 375°F. In ungreased 8-inch square (2-quart) glass baking dish, stir Bisquick mix and cinnamon. Stir in milk and oil with wire whisk or fork until blended. In medium bowl, mix sugar, peaches and lemon juice. Spoon over batter in baking dish. Bake 50 to 55 minutes or until golden brown. Let stand about 20 minutes before serving. Serve warm with ice cream. If fresh peaches are available, use 4 cups sliced peeled peaches instead of the canned peaches. Or, you can use a 16-oz bag of frozen sliced peaches, thawed. 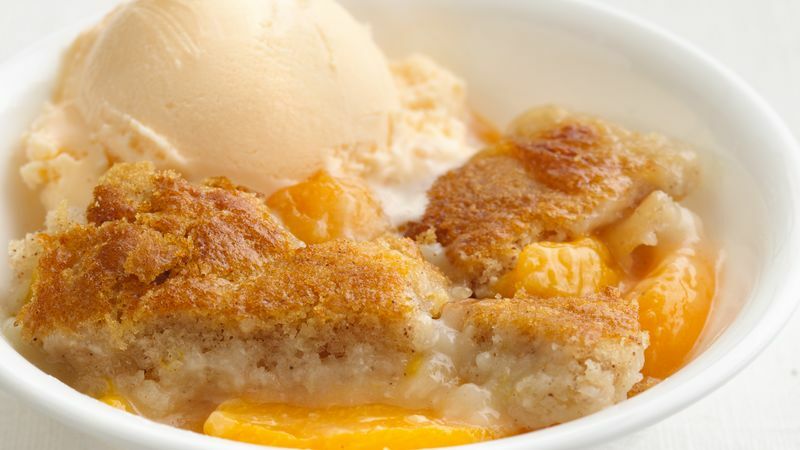 The lemon juice used in this recipe adds a little sparkle that perks up the peach flavor.